On November 2, at his meeting with President of Moldova Igor Dodon, Tatarstan President Rustam Minnikhanov, who is on a working visit to Kishinev, said that Tatarstan is interested in expanding cooperation with Moldova, however, the current volume of mutual trade does not correspond to available opportunities. 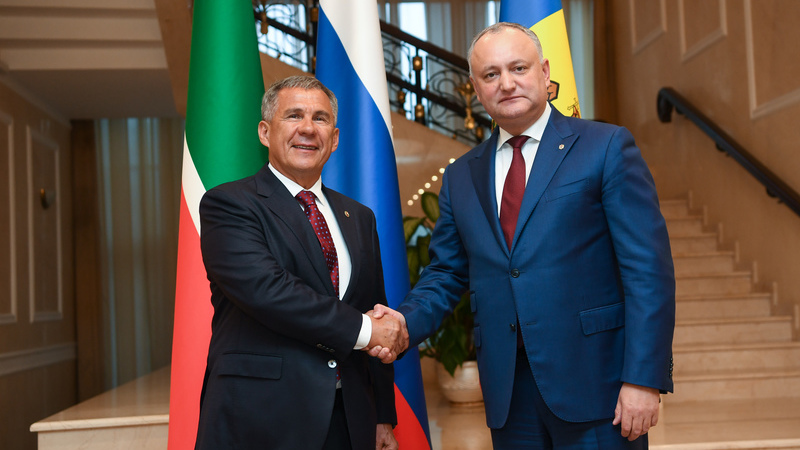 Dodon thanked Minnikhanov for paying a visit to Moldova. “We have met and discussed our bilateral relations many times. I am very glad that we signed the cooperation agreement Tatarstan and Gagauzia. I know that tomorrow you will take part in the investment forum in Comrat. I am very pleased that before your trip to the region we have met today in such a wide format to discuss all issues that concern our bilateral relations,” he said. President of Moldova, who concluded his official visit to Russia yesterday, noted that at his meeting with Russian President Vladimir Putin Russia-Moldova relations in the field of economics and the humanitarian sphere were discussed in details. “Our countries are strategic partners and have more than 160 agreements signed. We have established a legal framework for the development of bilateral relations practically in all areas. In the past two years, there has been positive development mainly due to agreements at the level of Presidents of Russia and Moldova. As part of this official visit, we have achieved serious specific results for our economic agents, exporters, migrants, and discussed issues related to the humanitarian sphere. This visit was more productive than all other ones that had been held before,” Dodon said. He noted that the positive dynamics of relations continues at the regional level. Speaking at the meeting, Tatarstan President thanked Dodon for his invitation to Moldova. He said that this was his first visit to this country. Minnikhanov expressed his confidence that the visit of Igor Dodon to Russia and his meeting with Russian President Vladimir Putin would help strengthen Russia-Moldova relations. He noted that Tatarstan attaches great importance to expanding cooperation with Moldova. Minnikhanov continued that the mutual Tatarstan-Moldova trade turnover makes 12 million US dollars and added that there is every opportunity to increase this indicator. “Our republic is the largest producer of petrochemical and engineering products in Russia. This visit will allow us to tell you our potential. We understand that Moldova also has a huge potential,” Tatarstan President stressed. “We have a lot of interesting practices, especially in the field of agriculture and industry. There are enterprises that want to invest and establish partnership relations. We have special relations with Gagauzia,” Minnikhanov added. On April 17, before a friendly match between veterans of hockey of Tatarstan and Bashkortostan, Tatarstan President Rustam Minnikhanov said that hockey is the most important sport both in Tatarstan and Bashkortostan.